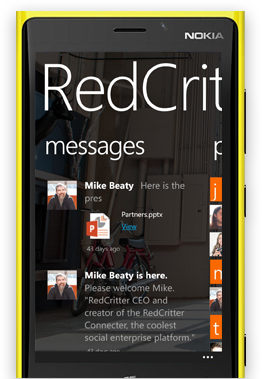 RedCritter Corp., today announced immediate availability of its free, self-named Windows Phone 8 app, RedCritter. 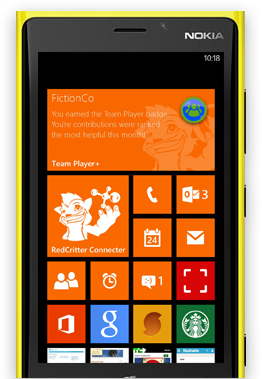 RedCritter for the Windows Phone 8 gives full mobile access to RedCritter profiles. RedCritter also offers an enterprise gamification platform, RedCritter Connecter, that allows companies to enhance their culture and make day-to-day work more engaging and productive. The app works with a company's existing business systems to automatically track, recognize and reward employees for their accomplishments. "RedCritter for Windows Phone 8 leverages even the most advanced features of Windows. It represents the cutting edge of enterprise gamification with support for voice control, bump sharing, contact syncing, storing and retrieving member profiles on NFC devices and even location-based group messaging." With the Windows Phone 8 RedCritter app users can view their accomplishments, receive accolades and send accolades to friends and colleagues and even purchase rewards using virtual currency that they've earned through their employer's enterprise gamification apps. The app also receives live tile notifications when users earn badges, complete training, increase skill levels or move up or down on company leaderboards. The app has built-in support for NFC tags. It allows users to bump their phones to any NFC device, such as NFC-enabled business cards, to store their profiles. Later if another user taps their phone to the NFC device the profile will instantly appear. Professionals can use the app to share their RedCritter profiles just by bumping phones, NFC devices, via link or their own personal QR code which is automatically generated. Group messaging features are also included. The app allows users to create groups that can be pinned to real-world locations. Others that near the location can discover the group and join in the conversation. Users can also create groups and store them on any NFC device. Later when other users tap the device, they are invited into the group. Other group messaging features include SkyDrive attachment support, photo support with previews and even ad-hoc polling with real-time results in pie chart format. The RedCritter Windows Phone 8 App is immediately available for free in the Windows Store. Visit http://www.redcritterconnecter.com/solutions/winphone to install it on your Windows Phone.